Amazon.com Price: $299.18 (as of 22/04/2019 09:20 PST- Details) & FREE Shipping. 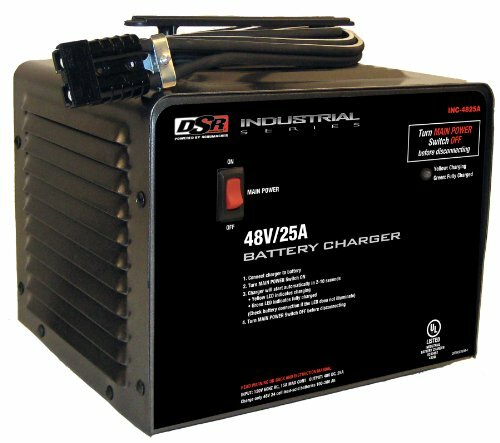 Schumacher’s Industrial battery charger charges 48 Volt lead-acid batteries, with a 15 to 25 ampere cycling output current. Features safe-start, reverse polarity and short circuit protection, where the charger will not apply current to the output connector until it is properly connected. Also includes standby and maintain modes to save power, with the maintain mode monitoring the battery voltage to keep it fully charged. Includes 8-gauge, 6 foot long output cables with a polarized 50 ampere quick-connect connector, an illuminated on/off switch, and multi-stage charging algorithm. Automatic temperature compensation automatically adjusts the output voltage based on the ambient air temperature, and the temperature controlled cooling fan provides efficient operation and peak performance. Also includes an all metal case with a powder coated finish for superior durability and patent pending “Thermal Runaway Protection”, which stops charging if the charger detects a problem with the battery. Industrial UL approved.